Pearmund Cellars was founded in 1976 and purchased by Chris in 1993 (with his first vintage in 2002), the estate has had active agriculture since the mid-1700s.. It is located in the foothills of eastern Fauquier County, VA. The winery spreads over 7500-square-foot and they farm 25 acres of vines: Chardonnay, Viognier, Riesling, Late Harvest Vidal, Merlot, Cabernet Franc, Cabernet Sauvignon, Petit Verdot, Ameritage. At the estate the oldest Chardonnay vines in Virginia are planted, while the rest of the grapes are sourced from various parts of the Commonwealth. The vineyard is managed with as little intrusion as possible, and the estate operates in a largely holistic, earth-conscious manner. They produce about 7,000 cases annually with an almost equal split between red and white. 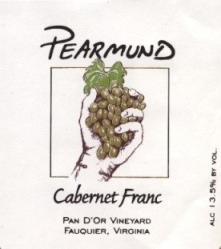 Pearmund Cellars was voted Virginia's Favorite Winery in 2007.